The ornamental fish keeping hobby is very easy to start, but to continue as ornamental fish keeper (aquarist) and keep the hobby going is entirely a different matter. Do you have time, enthusiasm and patience to become a good ornamental fish keeper? You might have come across people who have started the ornamental aquarium with lots of enthusiasm but later started neglecting their fish aquarium and left the hobby after some time. If you want to be a good fish keeper and start aquarium the foremost thing is to question yourselves whether you have sufficient spare time for looking after the ornamental pets. Remember that these are living beings requiring clean environment, clean water, proper food, proper feeding and if they fall sick proper treatment for them. In this hobby you will be required to spent some time learning to feeding them and looking after them. If your enthusiasm still hangs on, then probably you are a fit person to be an ornamental fish keeper and pronto you can start hobby. To keep an aquarium first of all you have to plan your budget and space to decide about the size of the tank or bowl and the type of pets you are going to keep. This activity can be divided broadly into branches like freshwater, brackishwater, marine (saltwater) and reef keeping and garden ponds. The freshwater aquarium hobby is by far the most popular and it is easy for the fish keeper. The beginner fish keeper can have many easy pets like guppies, mollies, platy etc. Marine aquarium hobby is for experienced fish enthusiasts and maintenance is difficult and expensive. As the pets are captured from wild, their availability is restricted and they are very expensive. The brackishwater pets are mostly those living in varying salinity (saltiness). Mollies, guppies, gobies, scats and soles are some of them. To maintain these aquarium is of medium difficulty as too much and sudden fluctuation of salinity may harm the pets. Experienced fish keepers go in for reef tank wherein they have live rocks, corals and other coral living life forms, virtually creating a coral reef environment. The garden pond may be kept indoor or out-door depending on the availability of space. Koi and goldfish are ideal for pet keepers. The garden pond fish keeper has to be careful in selecting the species for the pond as it is a large and exposed environment with weather elements having effect over the pond. Many experienced fish keepers take it as a hobby to create aquascapes where in they try to achieve harmony between the underwater terrain, aquatic plants and pet fish. This form of aquascaping is very interesting for a keeper and is fast spreading aquarium hobby. Basic responsibility of a fish keeper is to see that his ornamental aquarium hobby does not affect the environment. He should never release the ornamental fishes into water bodies, drains and canals. The pets may establish themselves in the water bodies and harm the native fauna (animals) and flora (plants). If the fish enthusiast has excess of some ornamental varieties he may exchange it with aquarium pet stores or a person pursuing the hobby. He should dispose of the dead ones from his aquarium by burying them deep so that infections to humans as well as pets do not spread. After handling fish pets, pet keeper must wash his hands with suitable disinfectant, as some pets in hobby trade are found to get affected by TB (Tuberculosis) which they can pass on to humans. Fish keeper must learn and know the environmental requirements of the ornamental hobby fish he is having in his aquarium, like volume of water required, temperature range, filtration requirements and diseases. Sufficient space must be available for the pet for its healthy life. Certain countries like Rome have banned people from maintaining ornamental fish in bowl considering that bowl is too small a place for a pet. When importing or exporting ornamental pets, thoroughly investigate to know the procedures of the States and Nations and international regulations so that you do not end up on the wrong side of the law enforcing authorities by your ignorance. 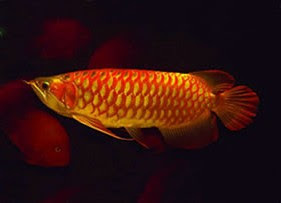 Arowana The links to other posts at the top are useful to fish keeper to know more about ornamental hobby and how to go about setting up an aquarium and its requirements.